Need a cue? 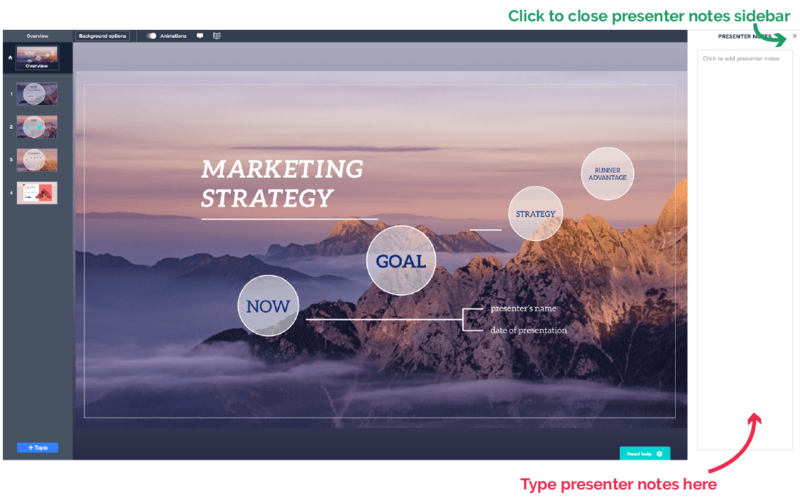 Use presenter notes in Prezi Next as reminders to highlight key information, or record questions and feedback from your audience while presenting. You can use notes to practice and prepare, then review them while delivering your presentation with presenter view. If working with others, collaborators that have editing rights to your presentation can also add and view presenter notes. 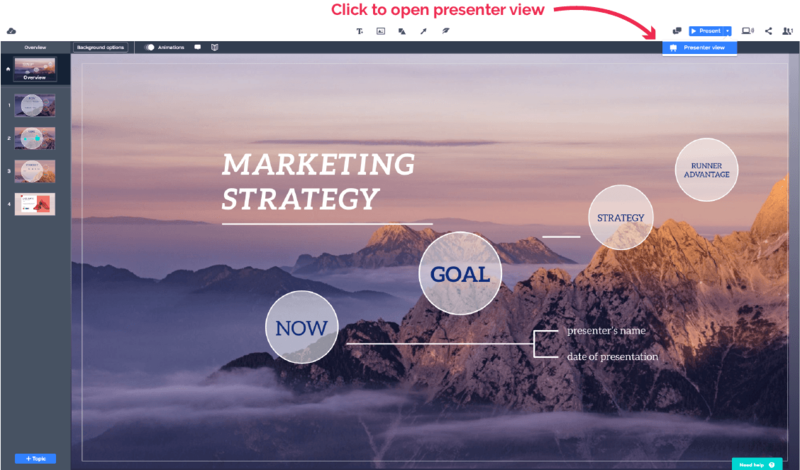 Paid feature: Presenter notes are available for users with a Plus or higher Prezi Next plan. Luckily it’s a breeze to upgrade your license and get access to this and all the other great features our Prezi plans have to offer. Note: Presenter notes are only available when using the Prezi Next desktop app. You can add presenter notes to a presentation’s overview, topics, subtopics, and pages. Notes will display in the place on the presentation’s structure where they were added. Click on the presenter notes icon in the context toolbar to display the “presenter notes” sidebar. You can also select View > Show Presenter Notes from the app menu. Type your notes into the textbox in the sidebar. Presenter notes automatically save as you type and can be edited and viewed by anyone with editing rights to your presentation. When finished, click the x in the upper right corner of the sidebar to close presenter notes. You can also add and view presenter notes when using presenter view. To open presenter view, click the arrow next to the Present button and select “presenter view”. You can also select Present > presenter view from the app menu. 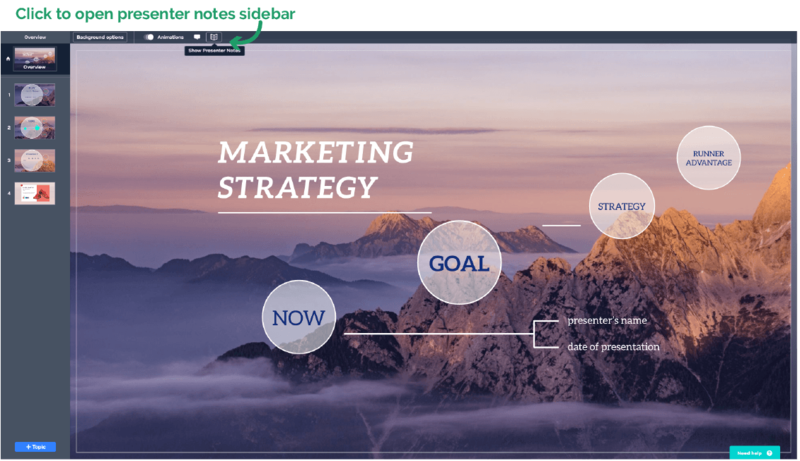 Use the left and right arrows to navigate through your presentation and review previously added notes. Click and type into the textbox to add new notes. You can delete presenter notes by using BACKSPACE/DELETE on your keyboard.